As I transition back into the usual flow of work, its time to share some images I captured over the last week. As stated the other day, I went to the West Coast of Auckland and took some images at Piha Beach. Nice and early in the morning, the water flowing to the beach was still (the surf beach that Piha is still had waves crashing) and the haze and spray of the sea drifting in. Although the sun was yet to come up properly, it was overcast. I set my tripod up and took a few shots, both with the Sony Nex and the Pentax MG, looking out past Lion Rock and into the island in the distance. I also attached a graduated tone filter to both, trying to give the sky some colour in the Nex, and bring out a little cloud on the MG.
Today’s image, from the Nex, is straight from camera, unedited aside from scaling and adding my sig. If I was to edit it, I think I might crop the aspect a little, but I quite like it as-is. 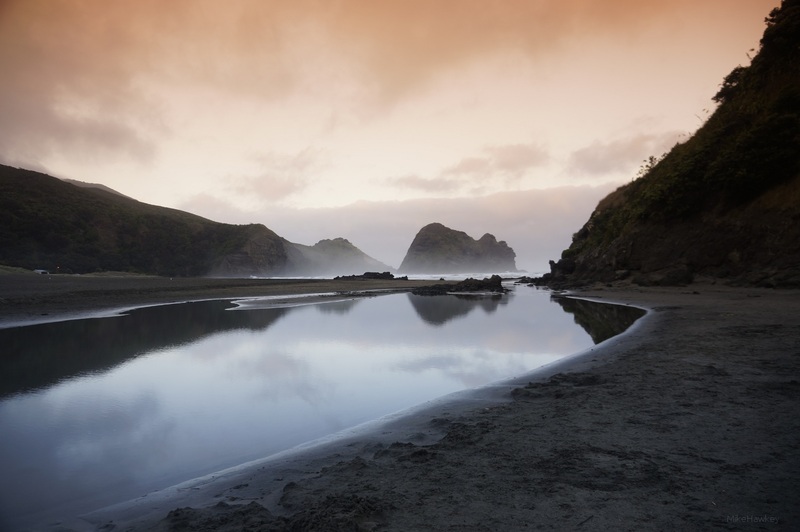 I will write some more about Piha in the coming days as I have a few images I wish to share. Today’s image brings about childhood memories for me. The stream in the foreground was great for sailing boats (model ones) and building dams on. I also recall as a youngster falling in fully clothed and being less than impressed. Piha is a black sand beach – it always seemed to stick much better than white sand, and ALWAYS got into my sandwiches as a child! Thank you! – love your work by the way. Stunning! Its such a great beach, I love the morning light you’ve captured here! Thank you! it is a great beach! Dude. This is your best one yet. This is a great image, Mike!